For these past 10 months in Europe, I have been forced to give up my normal diet of tropical veggies / soy products / surimi / seafood/ kueh / malay and indian foods and adjust to a diet very much based on seasonal vegetables, dairy and bread products. I think the largest change I had to deal with going from Singapore to Europe would be this difference in the variety of food, but also the absence of like-minded superduperly-food-obsessed companions (I think other cultural changes are slightly easier to deal with haha). There is no better homesick-therapy than dining with a friend who explodes in fireworks of joy over bakkwa (Chinese sweet bbq pork) and a bowl of plain rice porridge. But 10 months is also long enough to start feeling at home in this different world of food, and one of the things I will miss very much as I delve back into my Asian food haven this summer would be the crusty and flavourful European breads. Perhaps it was a sign to start nurturing my bread-baking skills when this week, Fakta slashed the price of high gluten wheat flour from 18kr (2.4 euros/SGD$4.20) per 2kg to a third of its price. Honestly, my experience with bread-baking is almost entirely limited to theoretical knowledge. 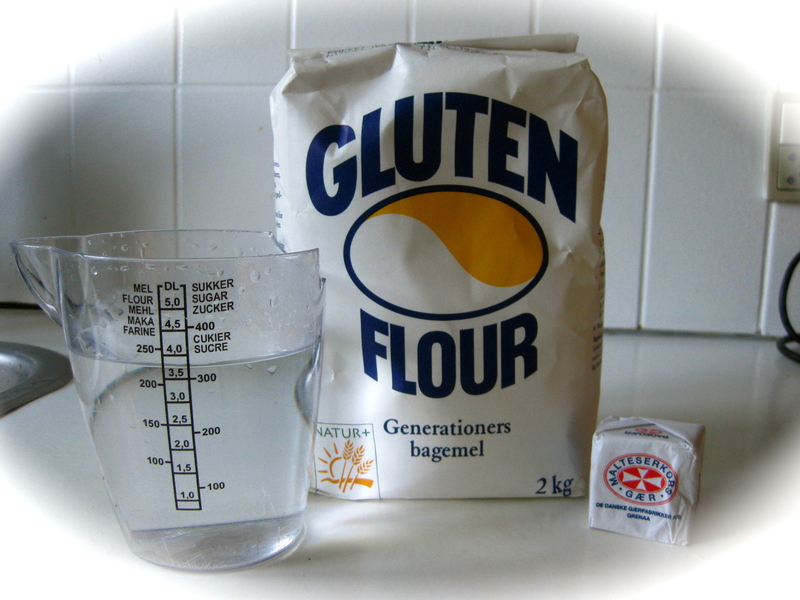 Apart from knowing that the requisites include a high-protein flour (to form strong gluten networks to trap the gas bubbles and give the bread a good structure) and yeast (that generates CO2 bubbles and lotsa lotsa lovely aroma compounds as it ferments the starch)…. I’m pretty useless when it comes to practical bread-baking. Hence for starters, I’ve decided to try Steamy Kitchen’s No-Knead Bread recipe, that is apparently ‘so easy even a 4 year old could do it’. My bread-baking skill level is evidently lousier than a 4-year old because I had some trouble following the instructions and ended up with quite a mess in the kitchen. I aborted the plan and decided to just shove my dough into the oven anyway and ended up with a pretty good result 🙂 Crispy crust and a soft spongey interior, though lacking in some saltiness and flavour. 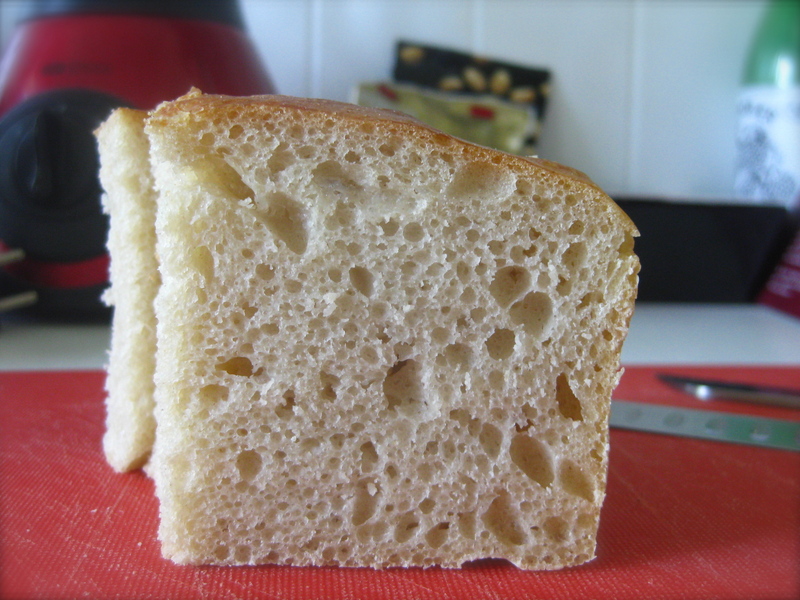 Well, I never eat my breads plain anyway — so I enjoyed it with a slop of salted butter and sweet thick honey. Delicious. 🙂 Goodbye <Gardenia>… Goodbye <Sunshine>…. Dissolve yeast in warm water then mix with the flour and salt using a spatula. Cover mixing bowl with plastic wrap and leave to ferment overnight. Dough becomes puffy and stickier. Fold dough around in bowl with a spatula, flouring the surfaces of the dough to reduce sticking to the spatula. After 5min, dump it into a floured loaf tin and leave aside to rise for another 2 hours. Preheat oven to 230˚C half an hour before baking. Cover loaf tin with aluminium foil and bake for 30 min. Uncover and bake for another 20 min or until golden brown and crusty. Surprise surprise! 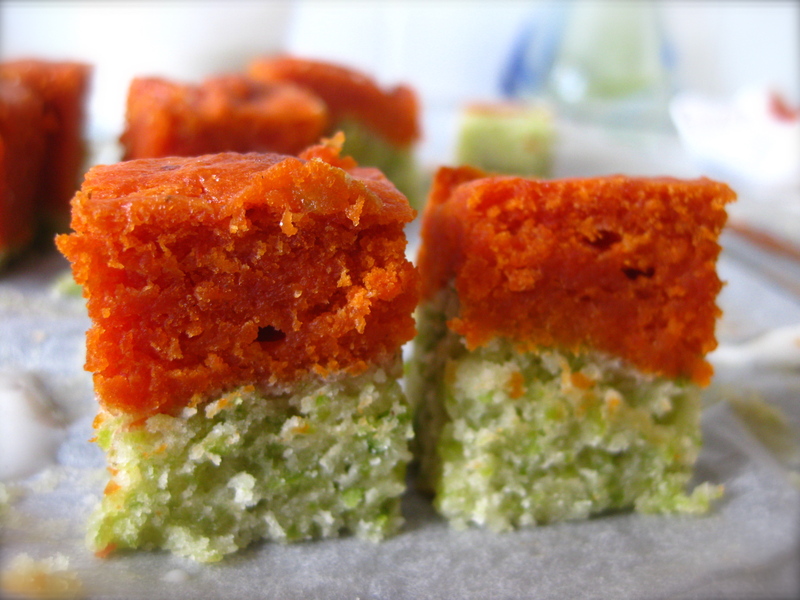 Another steamed cake recipe! When I say I am obsessed with something, I really mean it. I’m not going to just let it go after one try. I’d do it / make it / eat it again and again. But eating too much of the same thing would result in Sensory Specific Satiety and a decreased desire to continue eating it. That is why I set out to make as many variations of it. Neh. That was just some lame attempt to scientifically justify my actions. I simply want my muffins and cakes lower in calories, in all sorts of flavours that I like, yet still soft and moist so that I can enjoy my cakes and still have caloric allowance to enjoy all the other pleasurable foods that are out there waiting for me to enjoy. Is that too much to ask for? You might have realized that the basic recipe of flour-sugar-egg-baking powder limits the possibilities of variations to dry flavouring ingredients like spices, essences and currants. With just 4 ingredients on the list, it might seem rather difficult to make the ingredient substitutions… but I realized it actually isn’t that complicated, really. 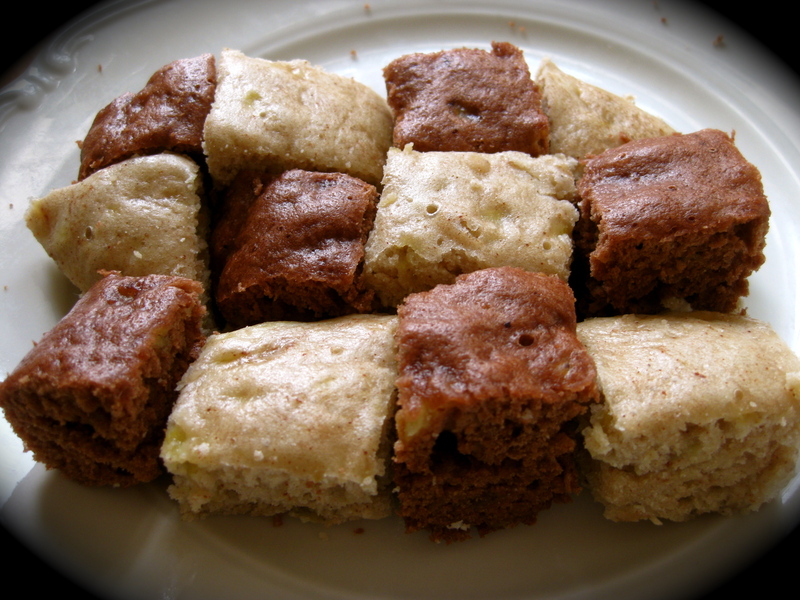 I found a recipe on chowtimes for steamed banana cake to make as a reward for my project group’s sensory panel. 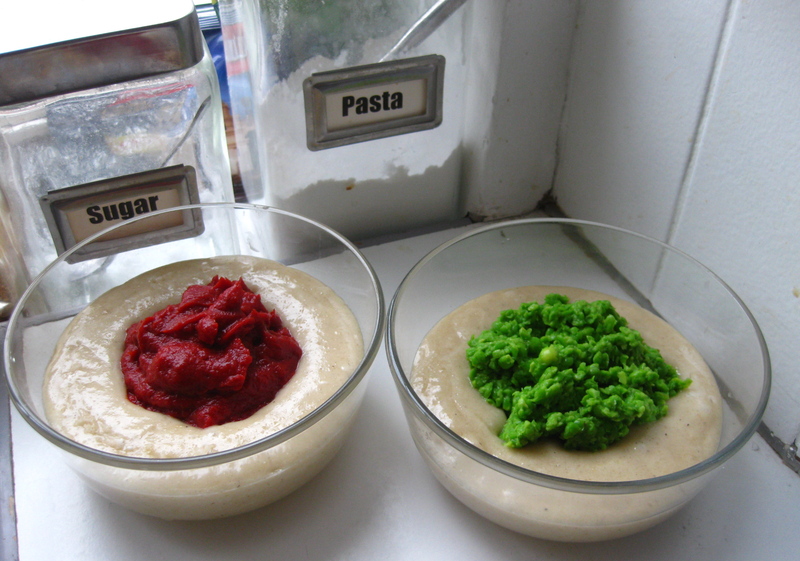 A quick comparison with the basic steamed cake recipe shows a partial substitution of egg (wet ingredient) with mashed banana (wet ingredient), and a larger amount of baking powder (1.5tsp vs 0.5tsp) to provide additional air bubbles for the rising of the cake that was originally contributed by the egg foam. The teaspoon of oil added contributes to a softer crumb texture as there is now less egg yolk (I’ll try it next time without oil just to see how significant the difference is). Mix the wet ingredients together and fold in the dry ingredients quickly. Voila! Done in a jiffy! Variation #1: with 1/2 tsp ground cinnamon added. While this was steaming, I mixed together Variation #2: with 1 heaping tsp cocoa powder added. 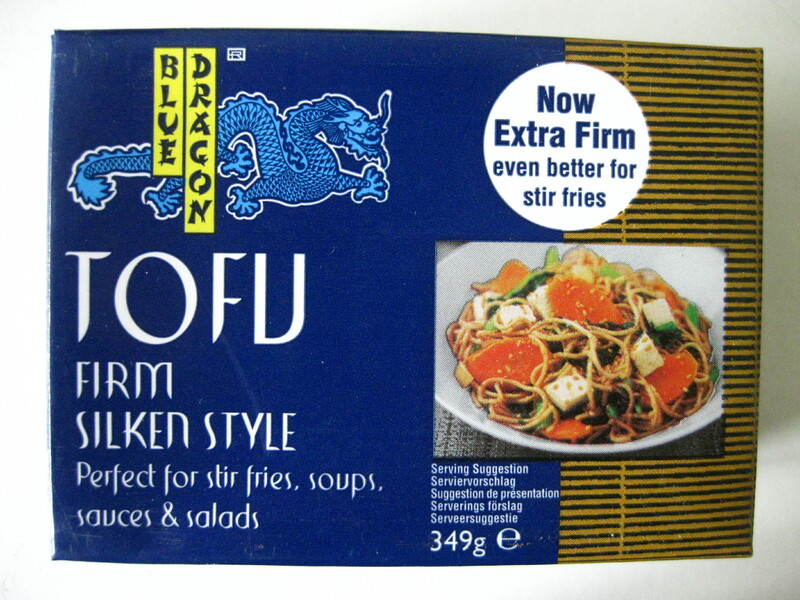 A couple of weeks ago, silken tofu was on sale at the supermarket Netto, and I couldn’t resist grabbing one tetrapack off the shelf despite it still being 5 times the price I would normally pay (as opposed to 15x–I’ve seen the same tofu selling for a ridiculous SGD$11/ 5.50 Euros elsewhere). 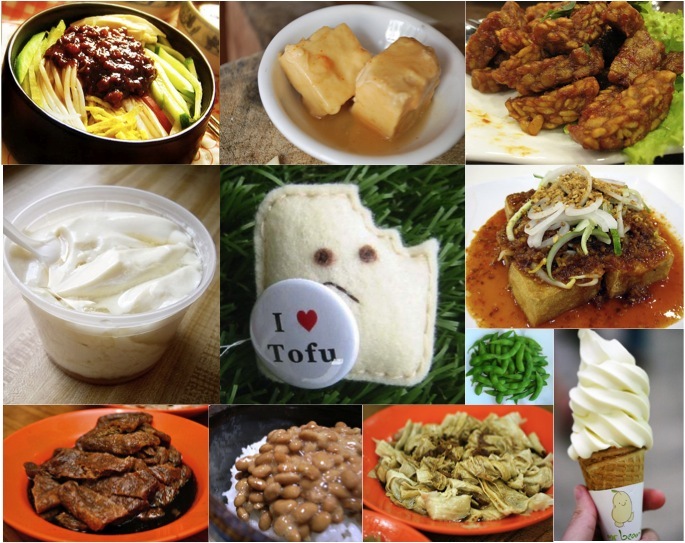 I miss tofu and all its soy relatives– silken, pressed, skin, dried, puffed, stuffed… tempeh, doubanjiang, edamame, soy milk/yoghurt/icecream…. 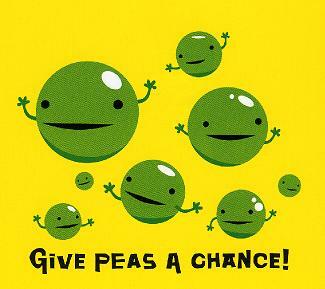 hmm perhaps even some natto on my rice now would make me one happy girl. Unbelievably this block of tofu survived uneaten for 2 weeks. Each time I’d reach for it and promptly put it back, hoping for recipe inspirations that would be befitting of tofu’s current gold-worthy status. I have no idea why I’m making such a big fuss about paying SGD$4– it’s not expensive per se (by Danish standards) but only expensive by comparison. Sometimes I’m just so stubborn. The good news is that in less than 7 weeks, I will be sitting by Mr Bean at Bukit Batok, pigging out on soya bean ice cream after stuffing my face with tahu goreng and yong tau foo… ahhh heaven. This recipe yields 50 small soft chewy cookies with the nutty bite of sunflower seeds, light crunch of coconut shreds and the mild fragrance of soy bean and vanilla. Put it back into the oven for 5-10 min longer if you’d like more of a crisp edge on the cookie for additional crunch and a popcorn-type roasty flavour. 1. Preheat the oven to 190˚C. 2. Combine all the ingredients together in a large bowl (tofu last). 3. Add some water (2-3tbsp) to make a thick batter that holds shape. 4. Spoon heaping teaspoons onto a baking sheet and flatten with the back of the spoon. 5. Bake for about 15-20min until slightly browned on the surface and crisp on the edges. Cookies will absorb some moisture upon cooling, so it doesn’t hurt to have the cookies a little drier/harder than you want it before taking it out of the oven. 6. Store in air tight boxes once cooled. Here, food assumes another purpose that is beyond that of satisfying the body and the senses. The only way it can then fulfill its purpose in existence is for it to be given away to others… to bring about as much joy as possible to as many people as possible. Yes, that must be its mission. I made these cookies with L and M in mind, two lovely architects whom we (6 of us sensory science students) have been working with for the past two months to conceptualize and realize an odour menu as part of an experimental theatre production (unfortunately the link is only in Danish) at the Temporary National Theatre. Looking back on the two months and six shows, I feel a happy fuzziness inside me that justifies each of those times I dragged my feet to lab to mix odorous chemicals and smelling like I’ve been brewed in beef broth for 24h…. and each of those times I cycled in the cold to get to the Skuespilhuset 45min away from home….I wanted to make something for them that was both delicious and simple (butter cookies) and attractive (definitely not the typical butter cookies), but at the same time embodies some element of drama and incomprehensibility of the Kafka theatre concept. I hope they like it. 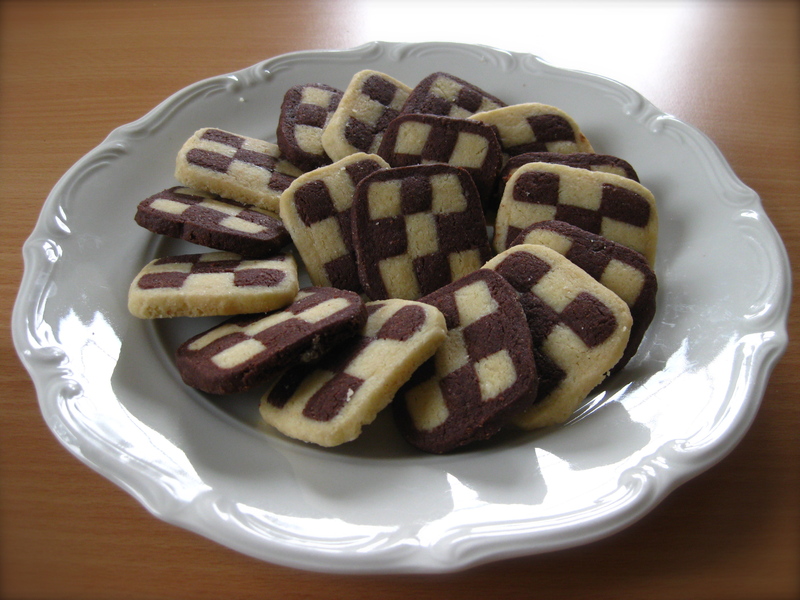 🙂 Now I shall divulge the secret of how-to-make-a-checkerboard cookie on this FAB session (okay, alright, you can easily find this on the internet lol)! 1. Cream butter and sugar until light and fluffy, then mix in extracts and salt. 6. 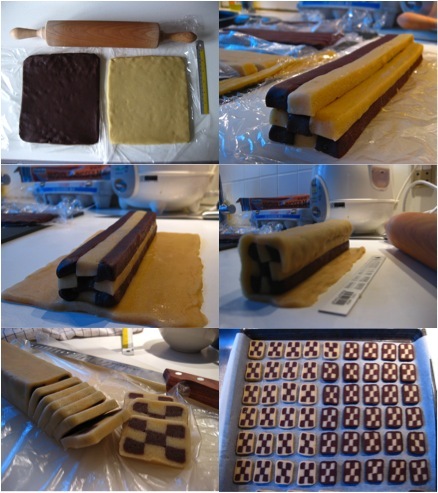 Cut out nine 1-1.5cm wide strips of each dough and set the remainder aside for the meantime. 7. Stack it up in alternate colours and brush edges with egg wash as you stack them together to help the strips stick together. 8. Roll out the remainder till it’s wide enough to wrap completely the stacked up strips. 9. Wrap in plastic wrap and place in the refrigerator for at least 30min to chill and firm up. Meanwhile heat up the oven at 175˚C. 10. 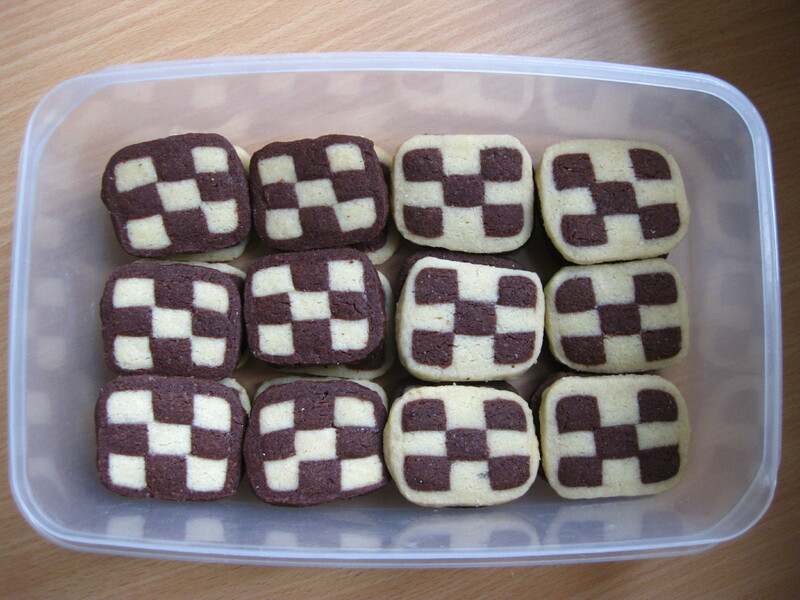 Unwrap and slice the cookies with about 0.5-0.7cm thickness. Bake on a cookie sheet for 12min. They will still be soft when warm. I transferred them to kitchen towels to soak up the excess fat. 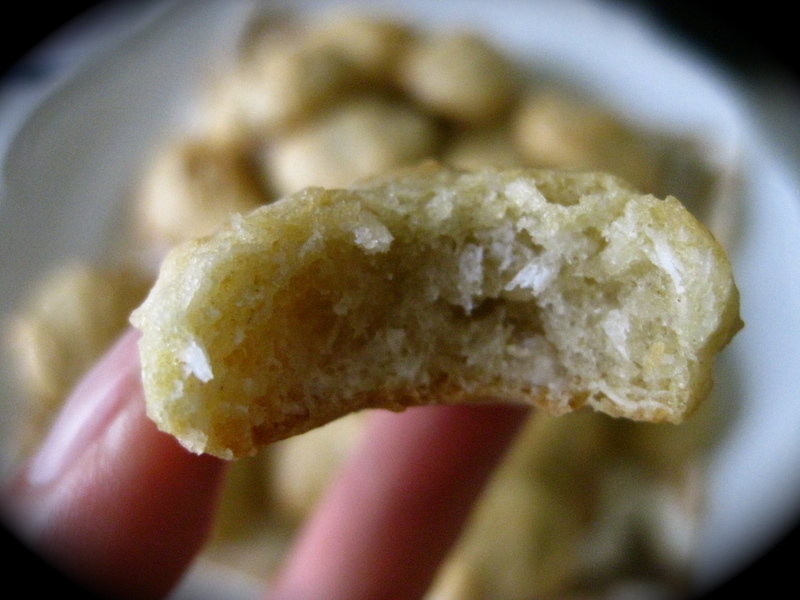 Cookies are crisp when cool (but not crunchy) like normal butter cookies. I am a compulsive snacker. Despite how anti-healthy it sounds, I must say that this addiction of mine is one of my greatest motivations and source of inspiration in developing healthier recipe alternatives with unexpectedly good flavour combinations and a chew factor to please a study snacker. First of all, because I have to keep eating all the time (I’ve a long reputation of being the skinny girl who is always hungry), I am always sourcing out affordable low calorie and nutrient dense snacks that I can munch on the whole day without doing my body too much damage. My current favourite snack food is bran flakes from Fakta, (18kr/SGD$4.50 for a huge box of 500g that would last me at least 2-3 weeks of snacking), which I put in milk or yogurt or in sandwiches for fibre and crunch; which I use as little dishes to hold flakes of reduced fat brunost (weird-sounding but good! ); or which simply tastes so delicious on their own. With a 70% composition of whole grains, 14.5g of fibre and 330kcal per 100g (one rice bowl of bran flakes is about 30g), I load up on fibre whilst getting a healthy dose of B1, B2 and B3 vitamins that are essential for health but often very much lacking in low-meat diets. Second of all, because I am munching all the time, I often pop one thing in my mouth after another, and make surprising discoveries when the residual flavours of the previous snack combines harmoniously with my next snack. Or with my drink. Flavour combinations that people normally don’t put together, but are sometimes a match-made-in-heaven just waiting to materialize. Two days ago, I was preparing a training presentation for my emotions research rater panel and snacking on a bowl of bran flakes and some ginger tea (2 slices of ginger in one pot of boiling water. Addictive right, L? ;)). It suddenly occurred to me that I should perhaps check if the ABC cake I have promised to share with my panel was still in lovely happy shape (just an excuse to eat lah), but I was rather upset that the crust at the base of my cake was now unrecognizable (moisture migration, what was I expecting?). Well, guess what I did? I stuck bran flakes at the base to recreate that crust and boy was it good! Then I sipped some ginger tea, and WOW the ginger balanced out the estery sweetness of the banana flavour really well! 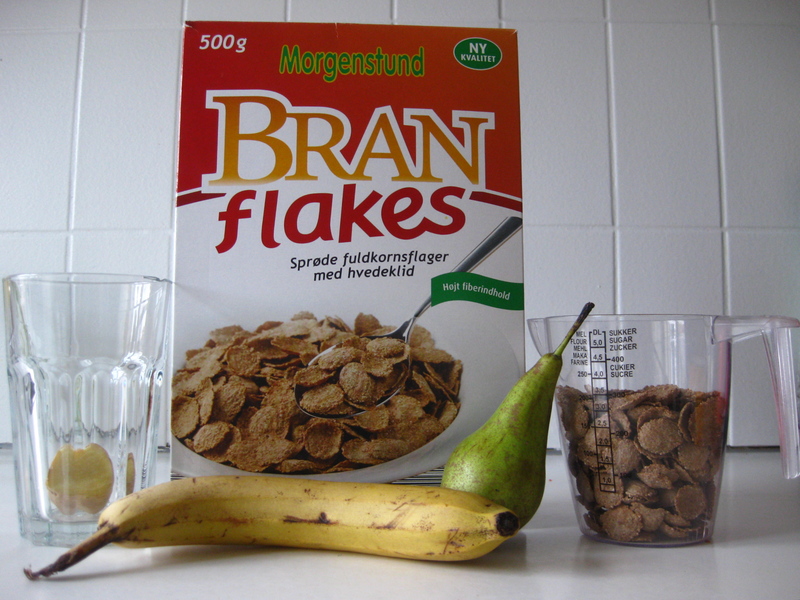 I also recalled a positive experience of bran flakes in pear-banana yogurt (fyi: one of the most popular yogurt flavour here in Denmark) and so I invited one of my pear friends to join in the party. Voila! 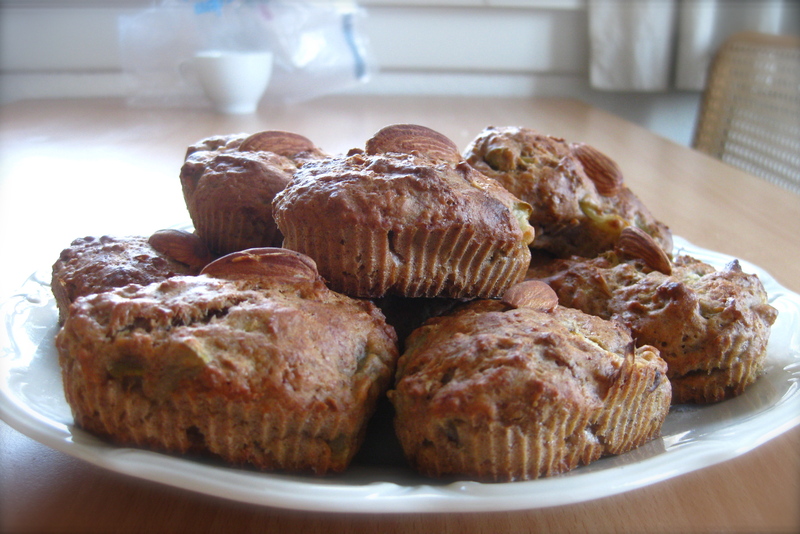 Ginger-Banana-Pear-Bran…and I pick….. MUFFIN! Quick and easy! 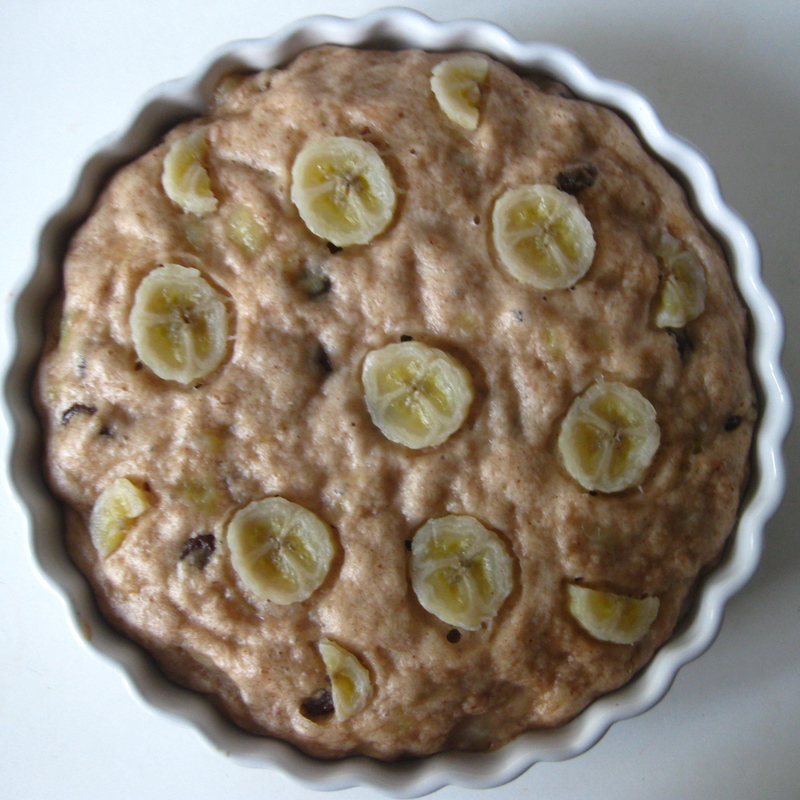 And with bananas in the recipe, going low fat is naturally predetermined. Preheat oven to 200˚C. Prepare 12 muffin cups (I used non-stick silicon muffin cups – no grease, no paper). Combine bran flakes and milk and stand till moistened. Mix in egg, oil, mashed bananas, ginger and chopped pear bits. In a separate bowl, mix the flour, cinnamon, baking powder, salt and sugar. Fold in wet ingredients (2) into dry ingredients (3). Mix till just combined. Fill muffin pan / holder until 2/3 full. Bake for 25min until top is golden brown. Ginger + cinnamon + banana = yum! I’d recommend adding some sunflower seeds or nuts. One almond on top was not enough to satisfy me. Overall the texture was pretty good, but I was hoping for the texture to be a little more tender. 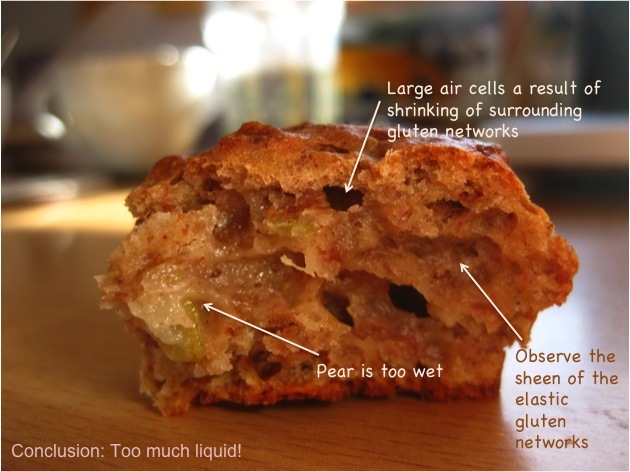 Too much liquid and too little fat enhanced the gluten development, especially around the bits of pear fruit. I’d take out the pear because its flavour was too mild (I’ll eat it on the side instead hurhur). And maybe I’ll add carrots instead. And avocado. Oh wait, that sounds familiar…? 😛 So take out the pear, and add another tbsp of oil. I’ll report my results next time. Eaters beware: with all this media hype promoting instant solutions to complex eating issues, it’s just so easy to fall into the trap of thinking that labels such as FAT FREE (cookies), CHOLESTEROL FREE (ice cream), NO MSG ADDED (cup noodles) or ONLY NATURAL INGREDIENTS (sweetened jams) are invitations to consume the food freely. Perhaps they might be to some extent more healthful options in relation to their counterpart containing the nutrient / additive specified in the claim, but they are not necessarily ‘healthy’ per se. A health claim is not a passport to gorge yourself with the food item, but simply a piece of information to suggest it might be good if you make a 1-for-1 replacement of whatever full / additive-laden version you’re using right now, and use it like you normally do. Let’s take the danish yoghurts for example: on a basis of 100g of yoghurt, a pear-banana flavoured regular yoghurt contains 90kcal (12g sugar, 3g fat), low fat 0.5% version contains 70kcal (12g sugar, 0.4g fat), a plain natural yoghurt contains 60kcal (3.5g sugar, 3.5g fat) and the low fat 0.1% version contains 35kcal (3.8g sugar, 0.1g fat). Conclusions: 1. flavoured yoghurts contain significantly more sugar i.e. calories 2. uncontrolled gorging on low fat/fat-free products is not a good idea unless you’re intending to compensate later in the day. Makes sense, right? 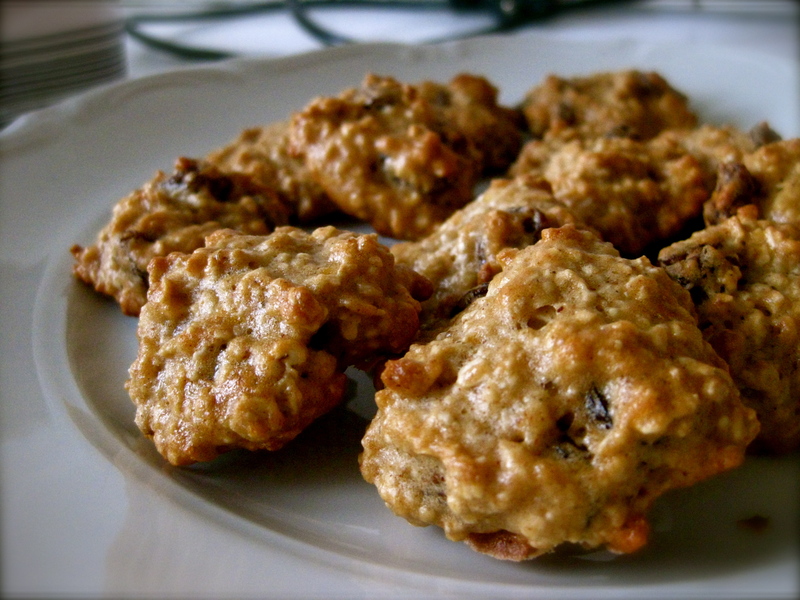 That said, here’s a nice fat free oatmeal raisin cookie recipe for you. I have picked this recipe for my FAB because: 1. I’ve got all the ingredients with me (my breakfast material), 2. 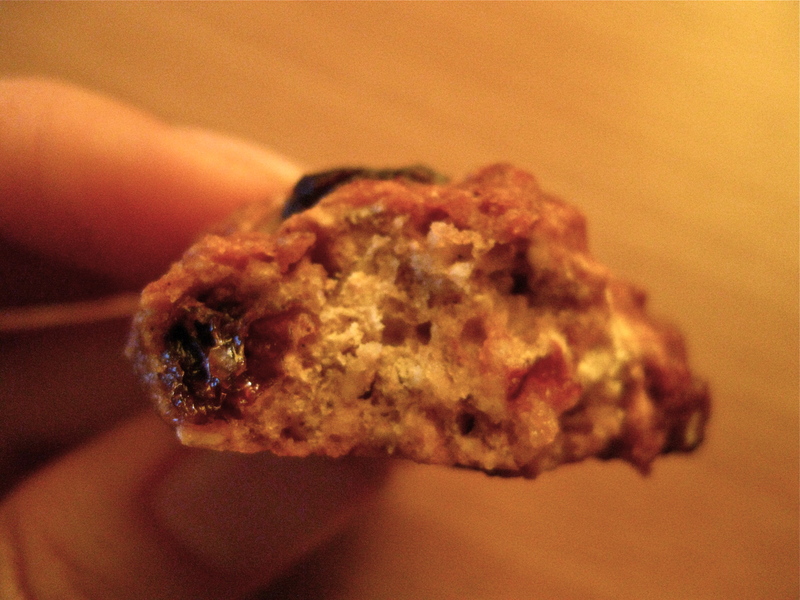 I love oatmeal raisin cookies, 3. it’s cheap, easy and fast, 4. I’m totally obsessed with chewy snacks and 5. if I can make some good study-snacks, while treating myself to some fibre and cutting the fat— isn’t that perfect?? But if you’re looking for a ‘healthy snack’, from a nutrition point of view, I’d suggest cooking the oats and skimmed milk into oatmeal instead. Nutritious and filling, with fewer empty calories and a lower GI index than these SWEET and ADDICTIVE chewy oatmeal raisin cookies. 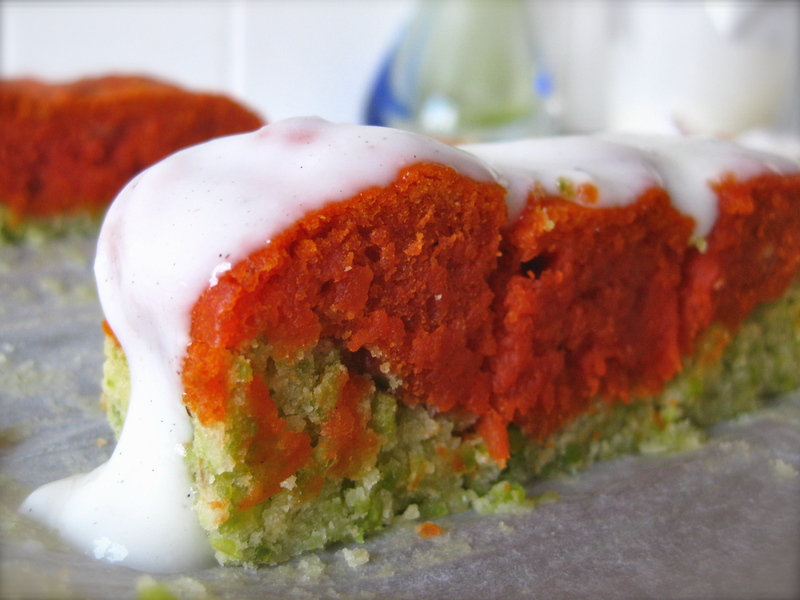 I’d make these over and over again, if I hadn’t so many recipes I want to try! Sift together flour, vanilla sugar, baking soda, cinnamon and nutmeg. Stir in rolled oats. In a separate bowl, mix all other ingredients. Combine (2) and (3) and mix well. Drop teaspoon-sized balls of batter onto non-stick cookie sheet. 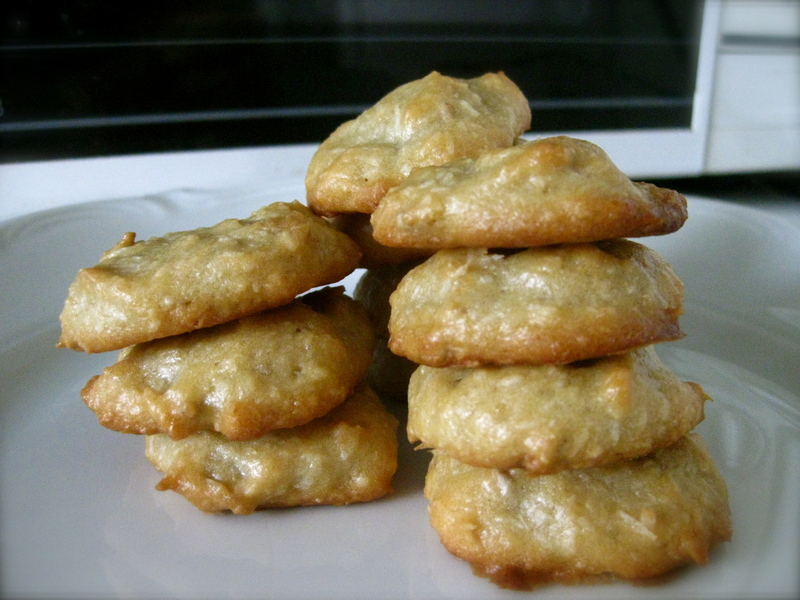 *Here’s an interesting article on pectin-rich material as fat-replacers in cookies. Recipe alternatives: out of curiosity, I placed some back into the oven to bake for another 3 minutes (tasters said yummy! – harder and less gummy) and some for 6min (too hard!). Still love both though, but I think next time I’ll flatten the cookies more if I were to bake it longer. Friday Afternoon Baking (FAB) is my new venture into regular baking. I love to bake goodies for special occasions such as festive seasons (Chinese New Year and Christmas), as well as for parties and birthdays. But why should I wait for such occasions in order to bake? Loving to bake IS good enough reason to get myself away from boring lecture notes and whip up some yummylicious goodies. My theme for FAB is the search for quick and easy recipes with affordable common ingredients that I can whip up in a jiffy and give away to friends weekly without burning a hole in the pocket. I first learnt about pretzels through Auntie Anne’s, a pretzel chain that is ever so ubiquitous in Singapore. In fact, Auntie Anne’s is pretty much synonymous with pretzels to almost any Singaporean. I’ve tried it once but never quite liked it because the one I had was soaked in an incredibly soggy amount of fat. Never really wanted another pretzel since then (in 2003 maybe?) until I had the fresh soft pretzels (mit Weißwurst und süßer Senf ) in Baden-Württemburg when I was there for a music festival in October 2009. The roasty flavour of the crust, with its soft interior and specks of saltiness was absolutely addictive. I was instantly hooked and each time I pop over to Germany (I was studying in Wageningen, NL for 6 months before Copenhagen), I’d always make it a point to grab a bag of these ‘steering wheels’. Pretzels are pretty simple to make, they’re affordable and they make a great breakfast or mid morning / afternoon snack. They are also particularly interesting, from the perspective of a food scientist. If you’ve had any hint of a chemistry education, you might have heard of Maillard browning — the non-enzymatic browning reaction that makes our lovely roast chicken brown and bursting with caramelic roasty aromas. The Maillard reaction is a very complex one, involving a cascade of reactions that begins with sugar and protein (I shan’t go into details of Schiff base formation)… but one interesting fact is that this reaction is promoted by a basic (opposite of acidic) environment, enhancing the extent of browning and flavour development. This is the key to the pretzel’s beautiful dark brown crust. Check out khymos for more chemistry! Here’s my first attempt at pretzel-making. Not exactly how it would look in a German bakery, but it tastes good, alright! Recipe was adapted from The Fresh Loaf, but I made 9 smaller pretzels instead of 6, sprinkled some poppy seeds and used yeast cakes instead of instant yeast (matter of availability). Enjoy! Disperse yeast in warm milk. Mix 2 cups of flour with salt, sugar and milk-yeast mixture. Add additional flour until combined into a soft dough. Knead until smooth (about 5 min), cover with plastic wrap, then set aside in a warm water bath to rest for an hour. 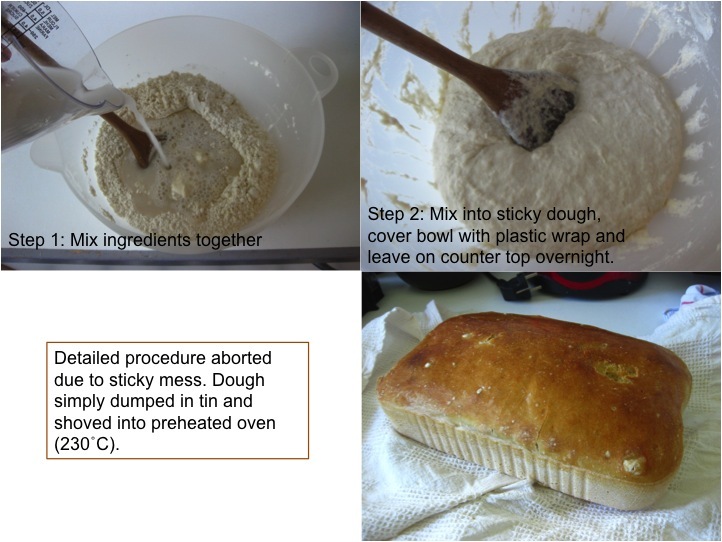 Preheat oven to 220˚C while preparing to shape dough. Shaping of dough: divide dough into as many portions as you want pretzels (how big do you want your pretzel to be? 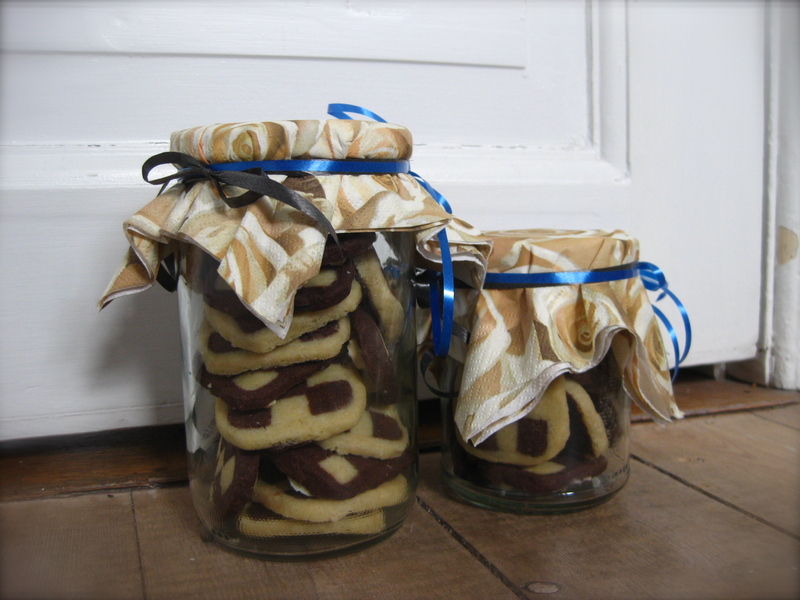 ), stretch into cylindrical lengths of dough (I find it easy to grab two ends and gently flick it like an elastic rope). Shape as desired. 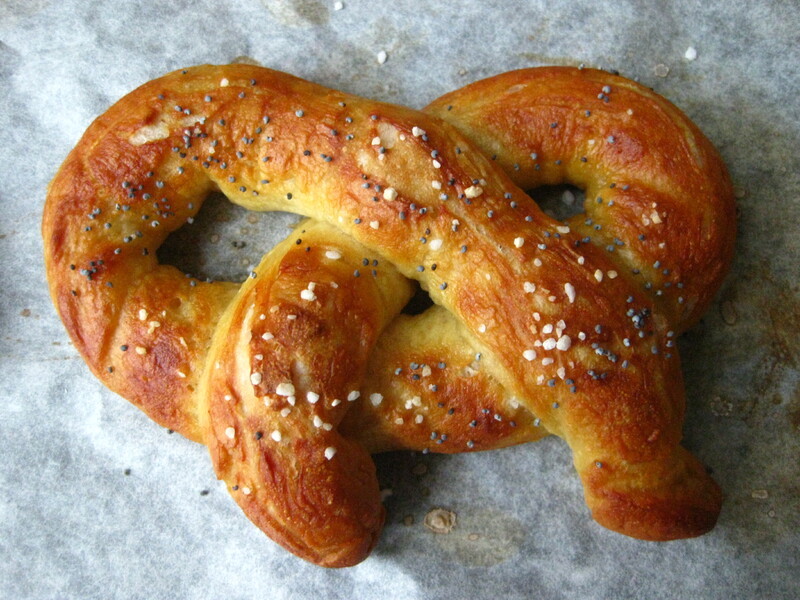 Dunk the pretzel in a simmering sodium bicarbonate bath for about 5 seconds, then transfer to a baking sheet and sprinkle with salt / sesame / spice mix / poppy seeds / cinnamon sugar / really, anything you want on your pretzel. Bake for 12-14min or until golden brown.